A brand new top model in which lies the heart and soul of 50 years of passion for perfection. With that goal in mind, Super Lauwersmeer is currently building at the shipyard in Noordburgum. With the Discovery 47 AC, the Frisian yacht builder will soon deliver a panoramic holiday villa on the water. The Frisian yacht builder has put all of its experience, knowledge and expertise into this design, which combines the spacious comfort and practical convenience of the AC line with the modern design of the OC models. It’s an amalgamation that many considered impossible, but which now definitely yields a brand new top model. With this contemporary hotspot, Super Lauwersmeer is once again putting its tradition as a builder of aft cabin boats in the spotlight. And so much of it! Thanks to a length of no less than 14.2 meters, the Discovery 47 AC has the largest floor area and most generous interior the shipyard has ever built. A hotel room as an owner's cabin, a fully equipped laundry area, a bathroom and kitchen just like at home and a guest room that could just as well serve as the owner's cabin. Everything is possible. Whether in the aft cabin or in the bow, comfort, luxury and space are everywhere. With a headroom of 2.05 meters, the salon is the ultimate breathtaking feature. Thanks to the gigantic windows of the construction, the open character and the beautiful incidence of daylight overwhelm you. It’s as if you are entering a sailing conservatory! The aft deck is also well-sized, which offers numerous practical advantages. The swimming platform is higher than usual and the steps of the staircase towards the aft deck are deeper. Moreover, the steering is positioned so that a huge space and a panoramic view are created. And then there is also the multifunctional hood. With a few simple clicks, you can choose a closed hood, a bimini or a convertible look. The generous dimensions and the smallest details of the 47 AC ensure the comfort of holiday villas everywhere. Yet this is not at the expense of design, because the modern lines are a feast for the eyes. The elongated silhouette gives the yacht a slender shape, with the straight stern as a unique feature. The sportily placed front windows and the windshield with a unique look, the aluminium radar bracket and the stepped hood all merge into a smooth line. The sides also form a symmetrical and streamlined whole. The culmination of half a century of customer ideas, desires and needs has delivered a sublime standard model. But Super Lauwersmeer would not be Super Lauwersmeer if it could not be customised. 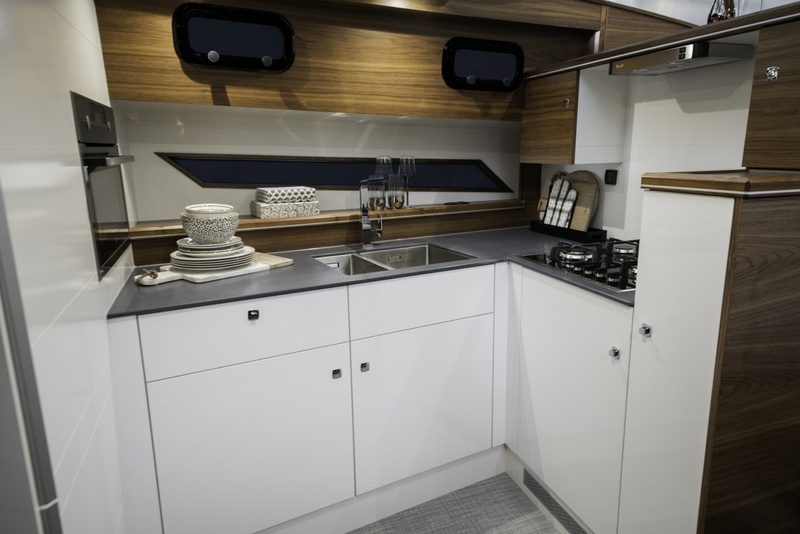 Therefore you can place the kitchen on top in the saloon, have the owner's cabin in the bow and make the third cabin the launderette. In this way, Super Lauwersmeer delivers your ultimate water sport dream with the customisation of the Discovery 47 OC. The Discovery AC is available in 41, 45 and 47 feet (12.50, 13.70 and 14.20 m).